Do you have an EMC probe in your toolkit? Probably not, unless you’re in the business of electromagnetic compatibility testing or getting a product ready for the regulatory compliance process. Usually such probes are used in anechoic chambers and connected to sophisticated gear like spectrum analyzers – expensive stuff. But there are ways to probe the electromagnetic mysteries of your projects on the cheap, as this DIY EMC testing setup proves. As with many projects, [dimtass]’ build was inspired by a video over on EEVblog, where [Dave] made a simple EMC probe from a length of semi-rigid coax cable. At $10, it’s a cheap solution, but lacking a spectrum analyzer like the one that [Dave] plugged his cheap probe into, [dimtass] went a different way. With the homemade probe plugged into an RTL-SDR dongle and SDR# running on a PC, [dimtass] was able to get a decent approximation of a spectrum analyzer, at least when tested against a 10-MHz oven-controlled crystal oscillator. It’s not the same thing as a dedicated spectrum analyzer – limited bandwidth, higher noise, and not calibrated – but it works well enough, and as [dimtass] points out, infinitely hackable through the SDR# API. The probe even works decently when plugged right into a DSO with the FFT function running. Again, neither of these setups is a substitute for proper EMC testing, but it’ll probably do for the home gamer. If you want to check out the lengths the pros go through to make sure their products don’t spew signals, check out [Jenny]’s overview of the EMC testing process. 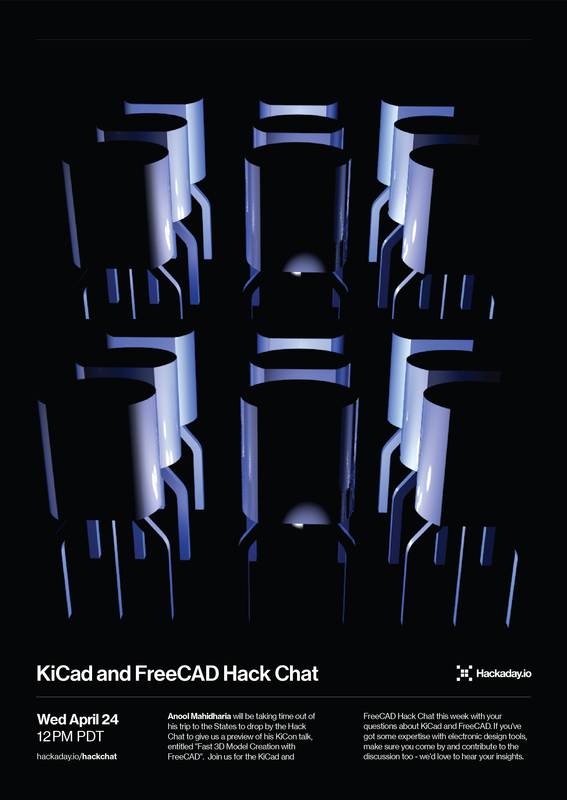 Join us Wednesday at noon Pacific time for the KiCad and FreeCAD Hack Chat led by Anool Mahidharia! The inaugural KiCon conference is kicking off this Friday in Chicago, and KiCad aficionados from all over the world are gathering to discuss anything and everything about the cross-platform, open-source electronic design automation platform. As you’d expect, Hackaday will have a presence at the conference, including a meet and greet after party. There’ll also be talks by a couple of our writers, including Anool Mahidharia, who’ll be taking time out of his trip to the States to drop by the Hack Chat with a preview of his talk, entitled “Fast 3D Model Creation with FreeCAD”. Join us for the KiCad and FreeCAD Hack Chat this week with your questions about KiCad and FreeCAD. If you’ve got some expertise with electronic design tools, make sure you come by and contribute to the discussion too — we’d love to hear your insights. And as always, you can get your questions queued up by leaving a comment on the KiCad and FreeCAD Hack Chat event page and we’ll put them on the list for the Hack Chat discussion. Our Hack Chats are live community events in the Hackaday.io Hack Chat group messaging. This week we’ll be sitting down on Wednesday, April 24, at noon, Pacific time. If time zones have got you down, we have a handy time zone converter. That first glimpse of a child in the womb as a black and white image on a screen is a thrilling moment for any parent-to-be, made possible by several hundred thousand dollars worth of precision medical instrumentation. This ultrasound machine cobbled together from eBay parts and modules is not that machine by a long shot, but it’s still a very cool project that actually gives a peek inside the skin. The ultrasound transducer used by [stoppi71] in this build has an unusual source: a commercial paint-thickness meter. Cue the jokes about watching paint dry, but coatings measurement is serious stuff. Even so, the meter in question only ran about $40 on eBay, and provided the perfect transducer for the build. The sender needs a 100V pulse at about 5 MHz, so [stoppi71] had some fun with a boost converter and a 74121 Schmitt-trigger one-shot driving a MOSFET to switch the high voltage. On the receive side, the faint echo is sent through a three-stage amp using AD811 op amps before going through an LM7171 op amp acting as a rectifier and peak detector. Echos are sent to an Arduino Due for display on a 320×480 LCD. The resolution isn’t great, but the video below shows that it’s enough to see reflections from the skin of [stoppi71]’s forearm and from the bones within. [stoppi71] says that he was inspired to tackle this build by Murgen, an open-source ultrasound project. That project got further refined and entered into the “Best Product” category in the 2018 Hackaday Prize. We like that because focusing on turning projects into products is what this year’s Hackaday Prize is all about. The king of machine tools is the lathe, and if the king has a heart, it’s probably the leadscrew. That’s the bit that allows threading operations, arguably the most important job a lathe can tackle. It’s a simple concept, really – the leadscrew is mechanically linked through gears to the spindle so that the cutting tool moves along the long axis of the workpiece as it rotates, allowing it to cut threads of the desired pitch. But what’s simple in concept can be complicated in reality. As [Clough42] points out, most lathes couple the lead screw to the spindle drive through a complex series of gears that need to be swapped in and out to accommodate different thread pitches, and makes going from imperial to metric a whole ball of wax by itself. So he set about building an electronic leadscrew for his lathe. The idea is to forgo the gear train and drive the leadscrew directly with a high-quality stepper motor. That sounds easy enough, but bear in mind that the translation of the tool needs to be perfectly synchronized with the rotation of the spindle to make threading possible. That will be accomplished with an industrial-grade quadrature encoder coupled to the spindle, which will tell software running on a TI LaunchPad how fast to turn the stepper – and in which direction, to control thread handedness. The video below has some great detail on real-time operating systems on microcontrollers as well as tests on all the hardware to be used. This is only a proof of concept at this point, but we’re looking forward to the rest of this series. In the meantime, [Quinn Dunki]’s excellent series on choosing a lathe should keep you going. Gosh, the fun we had when digital calculators became affordable enough that mere grade school students could bring one to class. The discovery that the numbers could be construed as the letters of various dirty words when viewed upside down was the source of endless mirth. They were simpler times. This four-letter-word “clock” aims to recreate that whimsical time a bit, except with full control over the seven-segment displays and no need to look at it upside down. This descends from a word clock [WhiskeyTangoHotel] made previously and relies on a library of over 1000 four-letter words that can be reasonably displayed using seven-segment displays, most of them SFW but some mildly not. A PICAXE is used to select two of the four-letter words to display every second or so, making this a clock only by the loosest of definitions. Word selection is pseudorandom, seeded by noise from a floating ADC pin, but some of the word pairings in the video below seem to belie a non-random sense of humor. As is, there are over a million pairings possible; it might be fun to add in the full set of two- and three-letter words as well and see what sort of merriment ensues. While we like the Back to the Future vibe here, we’ve seen some other really nice word clocks lately. There was the one that used PCBs as the mask for the characters, and then a rear-projection word clock that really looks great. TraNguyenSeldat liked Stepmotor Driver Board for TI Tiva Launchpad. Stephane Bois has followed a list.